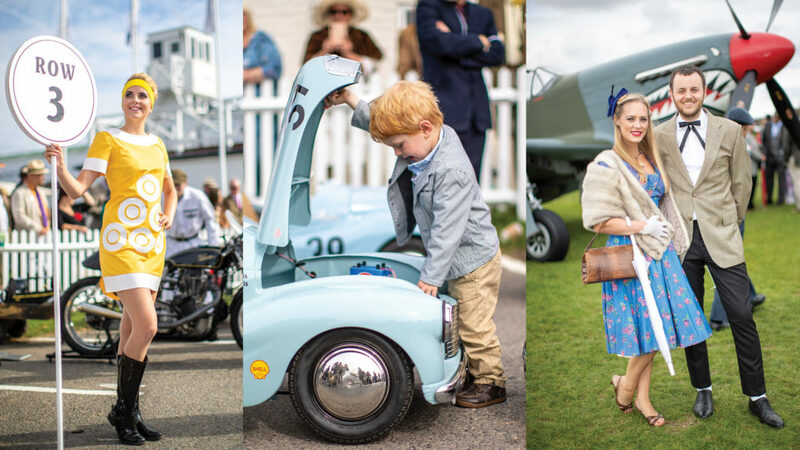 The 20th anniversary of the Goodwood Revival was a roaring success. The event was a complete sell out, with 146,000 people attending across the three days. Some 400 cars and motorbikes competed in 15 races, travelling from five continents. Two thousand five hundred hula hoops, 500 yoyos and 500 Slinkys were given away to guests, and the Goodwood Farm made 16,500 burgers and 20,000 sausages for the race weekend. Friday evening saw the start of racing, and it was Emanuele Pirro and Niklas Halusa who won the Kinrara Trophy in the 1961 Ferrari 250 GT SWB ‘Breadvan’. It was perhaps one of the most photogenic races ever staged, with the most glorious sunset as the cars raced down the Lavant Straight. Opening the proceedings on Saturday, Darren Turner took his first ever win at the Revival, in the Fordwater Trophy, at the wheel of the works 1950 Aston Martin DB2. Sam Tordoff took second place in his 1953 Porsche 356 despite bogging down on the line and entering the first corner at the back of the pack. 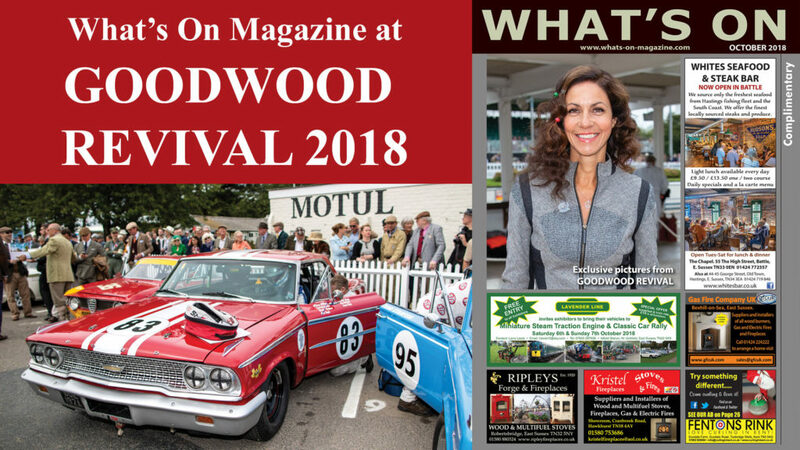 The Goodwood Trophy was won by Calum Lockie in a 1938 Maserati 6CM. In the inaugural Jack Sears Memorial Trophy it was the Jaguar Mk1 that proved to be the car to beat, with three of them on the podium, the winning driver, however, was John Young in a 1958 Jaguar Mk1. It was Mike Whitaker in a 1966 Lola-Chevrolet T70 Spyder that won the Whitsun Trophy at the third time of asking. Closing Saturday was the Freddie March Memorial Trophy, won by Martin Hunt in a 1954 HWM-Jaguar. Sunday’s racing opened with the Chichester Cup, resulting in Andrew Hibberd taking the win in a 1962 Lotus-Ford 22. Nicholas Padmore claimed the Richmond Trophy in a 1958 Lotus-Climax 16, but overall race winner awarded the Gordon Trophy was William Nuthall in a 1960 Cooper-Climax T53 ‘lowline’. The Barry Sheene Memorial Trophy, set across two races and an aggregate result, was won by Herbert Schwab and Troy Corser taking turns on a 1929 BMW R57 Compressor. Another aggregate result taken from both St Mary’s Trophy races saw Andy Priaulx and Steve Soper win in the latter’s 1963 Ford-Lotus Corina Mk1. Father-and-son pairing David and Oliver Hart were triumphant in the Royal Automobile Club TT Celebration in their 1963 AC Cobra. The penultimate race winner was Joe Colasacco in the Glover Trophy, driving a 1965 Ferrari 1512. Drawing a close on racing, and winning the Sussex Trophy, was Phil Keen in a 1959 Lister-Jaguar ‘Knobbly’. A mother-of-all-comeback drives, he started from the pitlane and charged to victory 25 minutes later, his team manager even shedding a tear. At the event’s prize giving, the Duke of Richmond presented several awards to the best and fastest drivers and riders of the weekend. The fastest lap on two wheels was given to Troy Corser on the 1929 BMW R57 Compressor for a 1min 32.927 lap. However, the fastest lap of the weekend went to Karun Chandhok in a 1964 McLaren-Chevrolet M1A for a 1m 20.238. The Rolex Driver of the Meeting was presented to Darren Turner for winning the Fordwater Trophy, coming second in the Whitsun Trophy and having a great drive in the TT, all without making any contact with another competitor, three very competitive races in three very different cars. 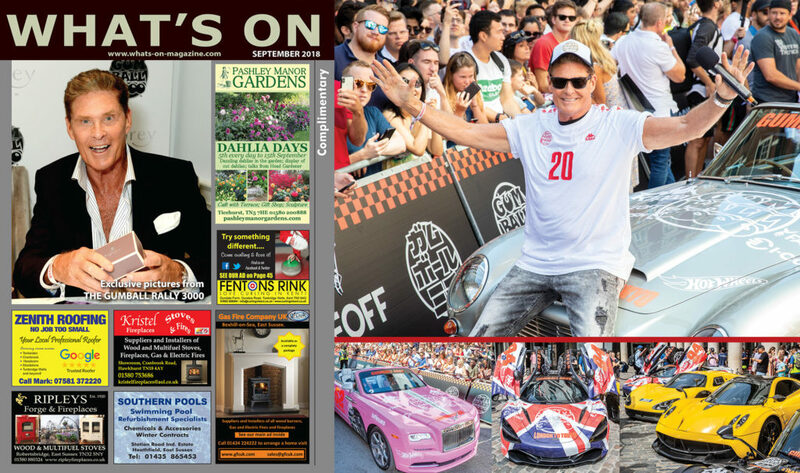 What’s On Magazine Sept 2018 is out now with our exclusive pictures from The Gumball 3000 2018 Rally. You will also find a comprehensive list of forthcoming events for September in your area as well as many London exhibitions. Pick up a copy at one of our many local distribution points including major supermarkets. David Hasselhoff, Usher and other celebrities attended the launch party at Proud, Embankment and the flag drop in Covent Garden of the 2018 Gumball 3000 Rally, the annual star studded road trip which raises money for Gumball 3000 Foundation to support a variety of charities. David Hasselhoff (66) and his new wife Hayley Roberts (38) were photographed for the first time since their wedding by What’s On Magazine at the Gumball flag drop, marking the start of the Gumball 3000 2018 Rally. The couple travelled to London following their recent wedding in the southern region of Puglia, Italy. David & Hayley met in 2011 while David was staying in the UK, during his judging stint on Britain’s Got Talent. The couple joined crowds of Gumball enthusiasts in Covent Garden, London.David wore acid wash jeans with a white sports shirt and Gumball cap, as he dropped the flag to start the rally. Hayley was the picture of summer chic in a floral summer dress and trendy Wayfarer shades, as she proudly watched her husband in action from the sidelines. The couple were obviously looking forward to staying out the limelight during their forthcoming honeymoon in the Maldives. The Gumball 3000 is an annual 3,000-mile international motor rally which takes place on public roads. It was started in 1999 by Maximillion Cooper, with the idea to combine cars, music, fashion and entertainment, taking its name from the 1976 film The Gumball Rally. This year, the rally takes drivers of vehicles including Ferraris, Lamborghinis and Aston Martins on a road trip to Tokyo, in the process raising thousands of pounds for charity. The 2018 route passes through Domaine De Chantilly in France, Sforza Castle in Milan, Italy and headed to Bologna to fly on Gumball air (A Malaysian Airlines airplane fully rented for Gumballers by the organizers of Gumball 3000 which stopped in Kazakhstan to refuel) to head to Osaka, Japan, some of the cars are also being flown over to Japan. In Japan they landed in Osaka and drove to Kyoto, Nanao ending in Tokyo where the Gumball finale party took place. 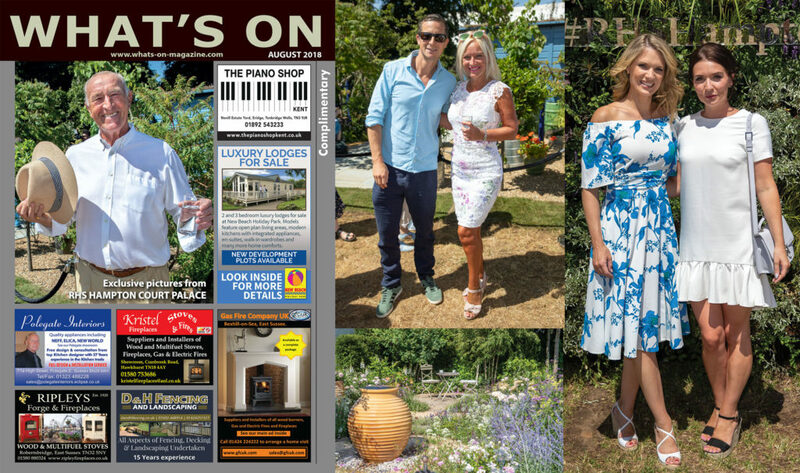 What’s On Magazine July 2018 edition features exclusive pictures from The Summer Party 2018 presented by Serpentine Galleries & Chanel. The party was Hosted by Yana Peel, Hans Ulrich Obrist, Michael R. Bloomberg, CHANEL, Christo and Adwoa Aboah. The Summer Party took place on Tuesday 19 June in the grounds of the Serpentine Gallery and the Serpentine Pavilion 2018, which is designed by the award-winning architect Frida Escobedo. This major annual fundraiser celebrates the Serpentine Summer Season and the year-round support of the Galleries’ friends, partners and collaborators. Following the success of last year’s collaboration between the Serpentine Galleries and CHANEL, which saw the pioneering art institution and iconic fashion house combine creative forces, the partnership developed for 2018 creating a unique event celebrating free art and free thinking and honouring the best of art and architecture in the heart of the city. Leading figures from the worlds of international art, architecture, design, fashion, music, film and business attended the party to celebrate and raise funds for the Serpentine’s globally acclaimed exhibitions, architecture, education and live programmes, which are free and open to everyone. Catering was provided by the prestigious Cellar Society; guests drank Margarita’s and Vodka Martini’s and ate Salmon Poke, Beef Tagliata and Beetroot and Blackberries. At Coco’s Restaurant, a seated dining experience by CHANEL, guests dined on Courgette Flowers, Rare-Roasted Hereford Beef and Roast Cod. Award-winning interior designer Joyce Wang created a bespoke ice-cream cart from which gelato, including sesame ice-cream with charcoal cookies, was served throughout the night. Immersive experiences included a new interactive installation by Es Devlin, MICROPHONE / MEGAPHONE, that used words donated in real time by guests; Google Pixel 2’s Pixel Portrait an installation designed by TEM that captured guests’ portraits in unique and shareable compositions derived from the colour palette of Christo’s London Mastaba; and Temporary Graffiti, an intervention by the art group RANDOM INTERNATIONAL that invited guests to paint with nothing but light itself to create their own ephemeral works of art. The Summer Party is organised by the Serpentine Galleries with support from CHANEL. The garden showcases a secure and sensory environment offering a tranquil woodland scene filled with soft, textured perennials. It is Morgan Stanley’s fourth year with Chris Beardshaw and has been designed to raise awareness of the work of the NSPCC. Gardens among the Gold Medal winners also included The M&G Garden with designer Sarah Price, The Wedgewood Garden by Jo Thompson and The Welcome to Yorkshire Garden designed by Mark Gregory, Managing Director of Landform who also received the Best Construction Award. Kazuyuki Ishihara’s O-mo-te-na-shi no NIWA – The Hospitality Garden won Best Artisan Garden meanwhile Best in the all new Space to Grow category was awarded to Urban Flow – in partnership with Thames Water, by debut RHS Chelsea designer Tony Woods. The new category offers original ideas, trends and take home messages to inspire visitors to transform their outdoor spaces. A total of 55 Gold Medals were awarded to nurseries and growers at the heart of the Show in the Great Pavilion. In addition a total of 35 Silver-Gilt Medals, seven Silver Medals and two Bronze Medals were handed out. The Diamond Jubilee Award for the best exhibit in the Great Pavilion was presented to Southfield Nurseries, who were awarded their 30th Gold Medal for their 30th appearance which also marked their last appearance at the Show before retiring from Chelsea. The coveted President’s Award was presented to Ashwood Nurseries for their display of Hellebores which are being exhibited out of season for the first time. 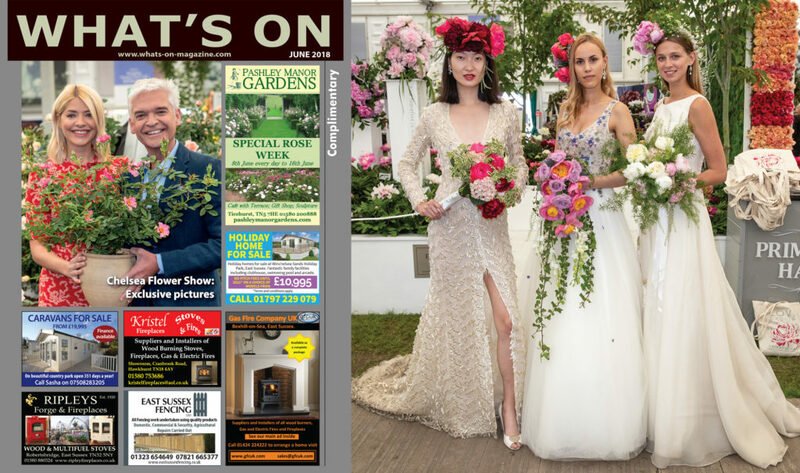 The Royal Horticultural Society (RHS) has awarded 124 RHS Medals to the gardens and floral exhibits in the Great Pavilion at this year’s RHS Chelsea Flower Show sponsored by M&G Investments. 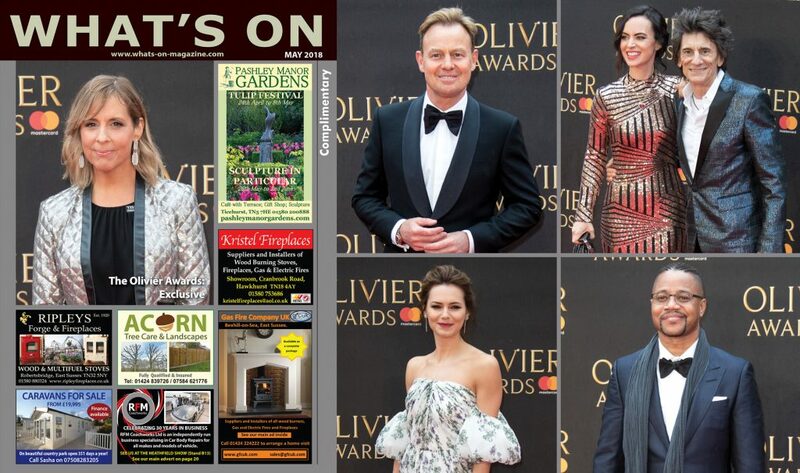 Our May 2018 issue features exclusive pictures from The Olivier Awards 2018, held recently at The Royal Albert Hall, London. Pick up a copy at one of our many local distribution points including major supermarkets. 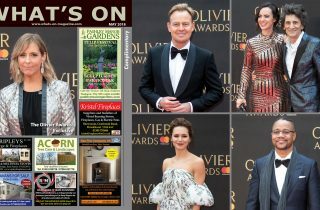 You will also find a comprehensive list of forthcoming events for May in your area as well as many London exhibitions. Shirley Henderson and Sheila Atim won Best Actress in a Musical and Best Actress in a Supporting Role in a Musical respectively for Girl From The North Country, Conor McPherson’s musical based on the work of Bob Dylan.